ZombieChat is Alexander Jarvis’s leisure project. The app came up during three weeks of Christmas holidays. It is evolved out of the need for a simple chat app that works off the grid and challenges the monotony. Its oomph factor is that it enables people to communicate with each other without the need for centralized communications infrastructure. So, even when the world blacks out ZombieChat carries on with delivering messages to nearby devices using a peer-to-peer WiFi and Bluetooth mesh network. 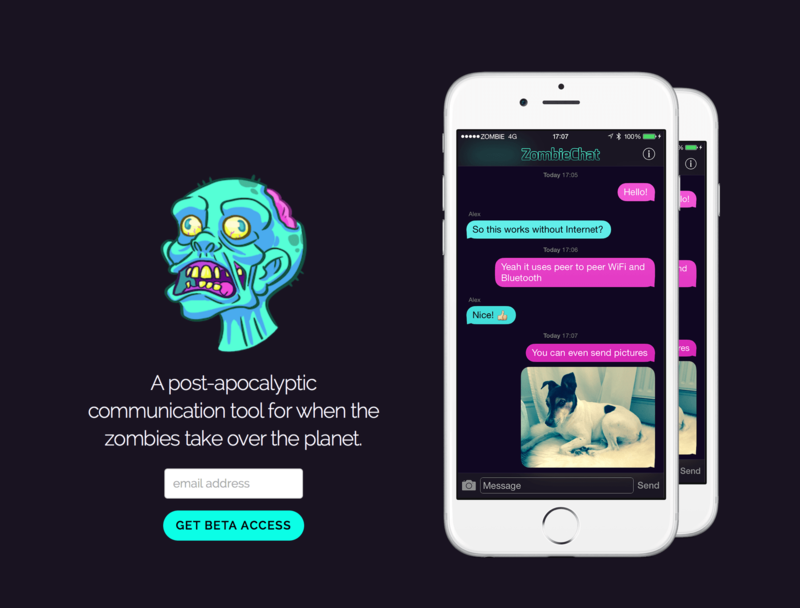 The story behind coining the app as Zombiechat is, it is expected to serve humanity in the case of a zombie apocalypse, we are definitely going to need a way to communicate with each other in order to coordinate and stay alive. The beauty of ZombieChat is that it does not use a server and so will easily scale with growth. As mobile phones get more powerful, allow peer-to-peer communication and wireless technologies, the communication technology is looming out from the austere to a centralized and fragile systems to relay messages. ZombieChat not only provide a way to communicate with people nearby, but it also combines this with a unique feature called “Survivor Beacons”. If someone else is using the app in your vicinity, you will be notified that a survivor has been found. ZombieChat does not require any sign-ups with your email. FireChat has a similar nearby chat feature but it is not as focussed as ZombieChat on providing only offline communications. “I hope to get enough downloads that the app will become useful during the zombie apocalypse. The value is in the network, so the more people using it, the more useful it will become.” expressed Alexander, the founder. Apocalypse preppers, technologists, freedom activists, privacy advocates are the prime punters of ZombieChat. The app is free to download and use, as there is no price that can be paid for saving humanity. Right now, the focus is to get the word out there and let people play with it. Previous article‘The Social Travel’- Join Your Friends On The Voyage! Next articleManage Your Accounts and Important Documents With Datamolino!